Well when people send you free stuff to try out it’s great until you actually have to do some work and write about the stuff your trying. 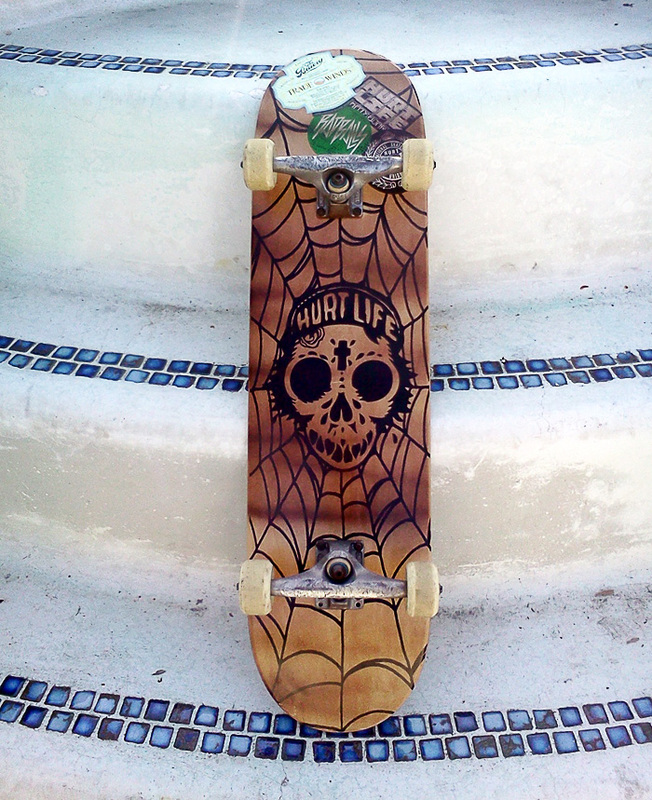 Hurt Life Skateboards is one of a few companies based in the inland empire that are doing it right these days. These guys make great boards and the owners actually skate pools which just warms my heart and makes my lower region tingle. The board they sent me came in a week before I had to get surgery so was able to ride it for 7 days and then hang it up for a little over a month. I was stoked to ride this board and the first week this thing only saw the roundwalls of many backyards. Then it was surgery time and I had to stare at this thing for a month before I could ride it again. My orthopedic surgeon wanted me to wait six months before I was skating again since this was the second time getting the same surgery. I had broke the bones and hardware they had originally installed and he didn’t want me to wreck it before it had healed all the way. The problem I had was that I was getting more wrecked mentally from not skating so I gave myself the diagnosis that it was time to skate for the sake and safety of others around me. Well let me tell you that this board brought the smile back on to my face and loud barking noises under my feet. So make the sacrifice of your hard earned cash and buy Hurt Life Skateboards and support the guys who live to ride. Oh yeah it measures out at 8.25 wide, 32 long with a 14.5 wheel base and the graphics are black concave is just right. If you call the Hurt Life guys and take them out for beers or to a pool they will give you a discount*. *There is a possibility the Baron Von might have made this sentence up.